Take a look at our very own Sylvester Manor YouTube channel to see all the latest and greatest video coverage of events, workshops, presentations and more. We invite you to explore our email newsletter archive to learn more about the history, happenings and evolution of Sylvester Manor Educational Farm. AMBROSE CLANCY PHOTO A stone in the Manor burying ground, marking a grave. Part of the North Fork History Project Series, Sylvester Manor reveals its past of enslaved people and their history in the Manor. Read the article here. Before there was a United States of America there was slavery. And, always, there was music. Read the feature here. Don’t read East Hamptonite Mac Griswold’s 2013 masterwork The Manor because February is Black History Month. Read it because every month is Black History Month, especially if you live in America. Read the review here. ANNETTE HINKLE PHOTO Stephen Searl, Sylvester Manor’s new executive director, and Tracy McCarthy, the organization’s new director of operations, in front of the Manor House. As the staff at Sylvester Manor Educational Farm looks ahead to 2018 and the upcoming summer season, they will do so alongside two new key players who recently joined the team. Read the article here. 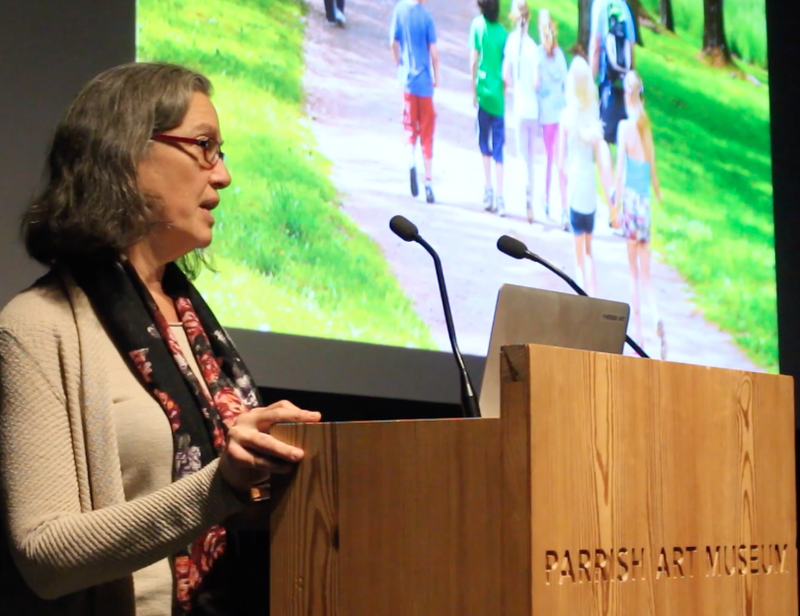 Sylvester Manor at "PechaKucha Night Hamptons"
Sara Gordon, Sylvester Manor Educational Farm's Planning & Conservation Consultant, was invited to participate in "PechaKucha Night Hamptons" at the Parrish Art Museum last December. This ongoing program introduces the creative community to each other through short format presentations of 20 slides with 20 seconds of speaking per slide. Experience the inspirational presentation Sara shared with the sold-out crowd here. Where did the idea of the Sylvester Manor Educational Farm come from, anyway? For a full list of Shelter Island Reporter articles about Sylvester Manor, click here.